It has been an unbroken tradition for me since 40 years to write an Abracadabra column for the annual special issue of Star of Mysore brought out on Feb.16 every year. When I opened it, the first inner cover had a legend written by hand in ink by my elder son Vikram Muthanna. It read: “Happy Birthday Dad, from Vikram, Mickey and Rupi, 27.12.2007.” Eleven years back to this day. My search for a subject ended here. Kahlil Gibran, the Lebanese poet and philosopher, first came into my life, influencing the understanding of my own personal life, when I purchased a thin book by him titled ‘The Prophet.’ There is hardly a subject and sentiment that he has not reflected on concerning we human beings — love, hate, children, death, country and more. And the subject for the Abracadabra that came to my mind was my country — India, Bharat, Hindustan; call it by any name it is the same. The only land of Hindus with a myriad culture, language, apparel, Gods and Goddesses. Others came later or Hindus got converted into other religions or remained Charvakas. Of course, I agreed with him but reminded him that for his children, America is their Janma Bhoomi and also Karma Bhoomi. I could see him grinning from molar to molar, happy! Thinking of a bird, I could not help thinking of wings. And this led me into the thoughts of Kahlil Gibran, who spoke of “broken wings.” Can a bird fly with broken wings? I am saddened because my country today is like a bird with broken wings. Earlier, these very wings were there flapping but the bird was flying in a wrong direction. A bird with broken wings cannot fly. But who broke the wings? Resistance to the new Modi Government began in the very first year of its statutory 5-year term. It began with contempt for the Prime Minister of our country which also belongs to these contemners. It all began with a Congress honcho assuring the partymen, just before the 2014 elections, that Narendra Modi a tea-seller in his younger days could never become a Prime Minister. If at all, after the elections, Modi could be given some space in AICC Office premises to continue his petty business of selling tea. This was followed by the ruckus in the JNU (Jawaharlal Nehru University), a beehive of Nehru-Gandhi and Leftist ideologues, with young students in their most impressionistic age. No wonder, voices against Modi were heard. Slogans like “Punjivad se lenge Azaadi’, ‘Manuvad se lenge Azaadi’,…. ‘Bhrashtachar se lenge Azaadi’, ‘Bhukmari se lenge Azaadi’,…‘Kashmir ke log sangharsh karo, hum tumhare saath hain’, ‘Afzal Guru zindabad’, etc., were raised. The most despicable, vituperative, mean and condemnable abuse at Prime Minister Modi came again from that same old Congress honcho who had said that a tea-seller could never become the Prime Minister of India. He called Modi a “Neech” in Hindi. The Opposition party must oppose, but this is abuse. There must be dissent in a healthy democracy. But to oppose what is good for the people and the country is to commit harakiri. Take the Bills on GST and Triple Talaq. The Talaq Bill in contrast to Shah Bano Bill passed by the Congress is a blessing for the Muslim women. Opposing a Bill because one is in the Opposition is not democracy. Democracy means dissent, debate and then decision. Be that as it may, today I must ask the Congress, the Leftists and the BJP three questions inspired from the wisdom gained reading Kahlil Gibran. Today in India there are two leaders: one of the past and one of the future. Which one are you? Come close, let me be assured by your appearance and conduct who you really are. Are you the one among those coming into the light or one going into the darkness? Are you a politician asking, ‘What your country can do for you or a zealous one asking what you can do for your country?’ If you are the first, then you are a parasite; if you are the second, then you are an oasis in a desert. Should I say more? Yes. We have in our country more politicians who are parasites, exceptions apart, than those who are oasis. 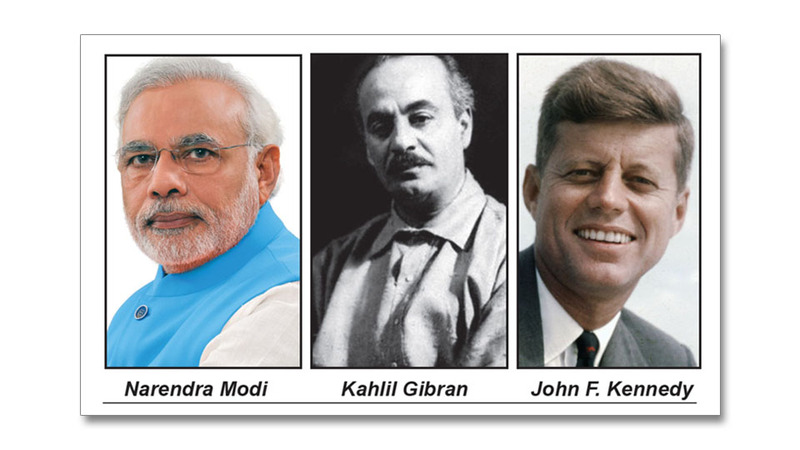 In fact, the statement of the late President of America John F. Kennedy made in his 1961 inaugural speech, ‘Ask not what your country can do for you, but ask what you can do for your country’ was borrowed from an article written by Kahlil Gibran 50 years earlier addressed to his people in the Middle East (West Asia for us). Now, may our politicians, who are one of the future, who are willing to come into the light and who will ask themselves what they can do for their country, please stand up?